Planning to travel for leisure? Or perhaps you need to fly for business purposes. 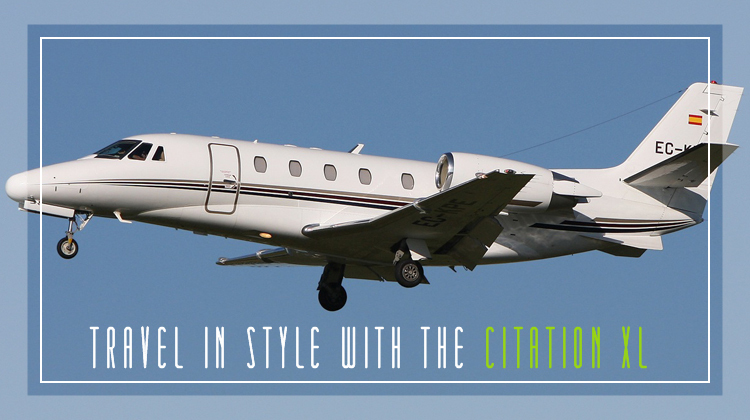 Seize the convenience which the business jet, Citation XL provides. With its combination of comfortable interiors and flight performance efficiency, you’ll have a pleasant flying experience while on board the stylish business jet. As an improved version of the Citation VII, the Citation XL is a top choice among turbo-propeller based aircrafts. Cessna’s Citation XL was introduced in 2004, and has become one of the most sought after aircrafts for short and middle ranged flights. Operated by 2 pilots, it can seat up to 8 passengers and you wouldn’t need to worry much about cabin space. This plane is also considered much roomier compared to other aircrafts within the same category. It even has a high Maximum Takeoff Weight (MTOW) which means you’ll be allowed to bring your necessities without having to scrimp on its content. Whether you’re opting for a short or medium range flight, your charter Citation XL has been customized to make the most of its allowable space. Aside from seating areas, this plane has spacious compartments for storage and additional spaces which may temporarily function as your closet. Upon reserving for a private flight on board the Citation XL, it’s also advisable to further inquire about its features catered for food and beverage preparation. The Citation XL is considered as a medium sized cabin plane. However both its pilots and passengers have found convenience in traveling via the aircraft with its allowance for large luggage pieces. This aircraft’s cabin is among the quietest when it comes to plane interiors within the same category. You’ll also find it has lesser drafts compared to its counterparts. The Citation XL has triple sealed doors and triple panes windows, ensuring its cabin is as quiet as possible. Manufactured by Cessna under the Textron Aviation Services, the Citation XL was a much more upgraded version of the Citation VII and Citation X. Citation XL was conceptualized to serve the twin-turbo propeller market. It was first flown in 1996, and was granted a certification by the Federal Aviation Administration (FAA) in 1998. This aircraft is still being produced, with its impressive safety records. Since its improvement from the Citation X and VII, the XL’s engines enable much faster speeds, with a higher Maximum Takeoff Weight and longer ranges. Today, the plane is manufactured and being widely distributed to companies, private owners, charter businesses and many other establishments.